As the U.S. economy keeps showing strength, the debate also continues over who deserves credit for it. Former president Obama has claimed that it is all his work, a somewhat creative interpretation of macroeconomic theory and the facts on the ground. In reality, Obama did not do nearly as much harm as he could have done had Congress been in Democrat hands, but to be fair, his second term was characterized by restraint in government spending in a way that, for example, we did not see under Bush Jr.'s White House tenure. That said, spending restraint does not make for an economic recovery. It is a necessary ingredient, but it is far from sufficient. The economy did not do very well under Obama, and a good chunk of the reason for that was Obama's highly irresponsible expansion of the regulatory state. There is no doubt that all relevant indicators point in a more positive direction since Trump took office. Trump, for instance, inherited an economy that was in the process of bouncing back after a long recessionary trough. This makes it hard to disentangle the results of his policies from the broader trend. It is fair, for instance, for Obama to suggest that the recession ended and the economy started growing again on his watch. In fact, if you were to chart various economic indicators on a graph, you would be hard pressed to find exactly where the Obama presidency ended and Trump’s began. To cite just one example, the U.S. economy created nearly 4 million jobs in the last 18 months of Obama’s term, virtually indistinguishable of the first 18 months of Trump’s. Tanner also points out that "economic and job growth should have been expected" at some point during Obama's two-term tenure. He also notes that regulatory incursions by the federal government, "such as Dodd-Frank and the Affordable Care Act" had a stifling effect on growth. 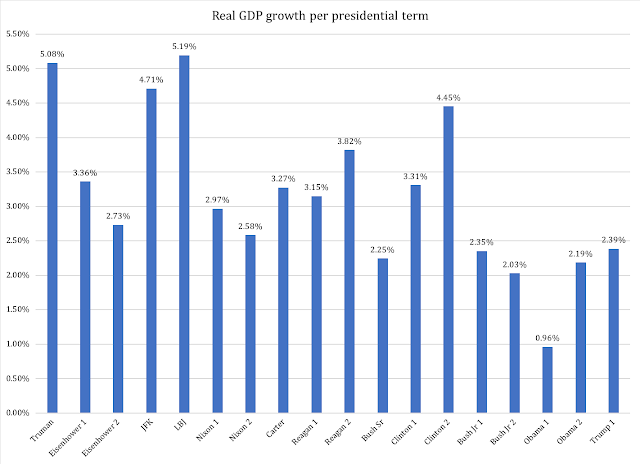 If we add the pile of environmental regulations, we have a good picture of why GDP growth did not reach three percent in a single year during Obama. Meanwhile, economic growth under Trump has averaged 2.9 percent, and will likely top 3 percent this year. That’s considerably more than the 1.5-1.75 percent growth rate predicted by the Federal Reserve Bank of San Francisco when Trump took office. I appreciate the point about economic forecasting; if econometricians got paid based on their ability to predict the economy, they would owe the world a lot of money. The number from the San Francisco Fed is an annual growth rate. Why does it matter what numbers we compare? Well, if we are going to compare Obama's economic record to Trump's we need to have the same yardstick. Tanner's confusion is understandable; as I recently explained, the BEA itself does not exactly contribute to the clarity of how their numbers should be interpreted. Before I sort out the confusion, let me go straight to the horse's mouth and report the BEA numbers that actually offer a fair comparison between the Obama and Trump administrations. As we can see, Trump's first term so far - calendar year 2017 and the first two quarters of 2018 - exceeds Obama's full second term, but the number is not 2.9 percent. So how do I reach a different number than the one Tanner reports? Here is how it works. Quarter-to-quarter percent changes are calculated from unrounded data and are annualized. Annualized growth rates show the rate of change that would have occurred had the pattern been repeated over four quarters (one year). Annualized rates of change can be calculated as follows: (((level of later quarter / level of earlier quarter)^4)-1)*100. Quarterly estimates are expressed at seasonally adjusted annual rates, unless otherwise specified. In plain English: the "annualized" rate is not an annual growth rate. It is a quarterly growth rate that is then assumed to be annual. By contrast, the numbers in Figure 1 above are actual annual growth rates. They are calculated as, for example, GDP in Quarter 2 of 2018 over Quarter 2 of 2017. This is a direct, genuine growth rate that is not "annualized". My method, which the BEA uses but not as visibly as the "annualized" rate, avoids another problem. Since the "annualized" growth rate is based on quarter-to-quarter growth, it varies from one season to the next. This is natural, as there are seasonal cycles to economic activity. For example, in the last quarter of the calendar year we always see a surge in consumer spending because of Christmas shopping; tourism-related industries tend to do better in the summer than in the winter. Since the BEA's "annualized" numbers are based on quarter-to-quarter growth, the growth rate they report as "annual" varies with the seasons. To account for these variations, the BEA adjusts their growth numbers for seasonal variations. The plain, hard truth, then, is that the numbers they report as "annualized" have two layers of statistical crafting between them and reality: "annualization" and seasonal adjustments. The numbers I report in Figure 1 do not need seasonal adjustment, as they compare the same season from one year to the next. Interestingly, the numbers that Tanner quotes from the San Francisco Fed are actually annual rates, not "annualized". In other words, Tanner compares apples and oranges. This is unfortunate, but it should not reflect on him as a public policy scholar. He is a smart guy who just finished a great book that I will write a review on soon. Nevertheless, it is important that we understand the data we use when we analyze and discuss the economy. When I was a college professor I always explained to my students, as they went off to take econometrics, that for every adjustment they make to their data they adjust reality to their model. Econometricians are notorious for doing this, which partly explains their inability to predict economic activity, but as the example of "annualization" shows, their affinity for statistical craftsmanship has contaminated the public discussion about the economy. Other than the problem with growth data, Tanner's article in the USA Today is well worth a read. In fact, his warning that the current growth in the U.S. economy might just be a form of "sugar high" is very good. I have written about this myself, and I intend to return to this point. There is a lot to be said about it.